1. Please download and fill in the Equipment Order Form. 2. Post the filled in form together with the payment to 15A, Ka Nin Wah Commercial Building, 423 Hennessy Road, Wan Chai, Hong Kong. 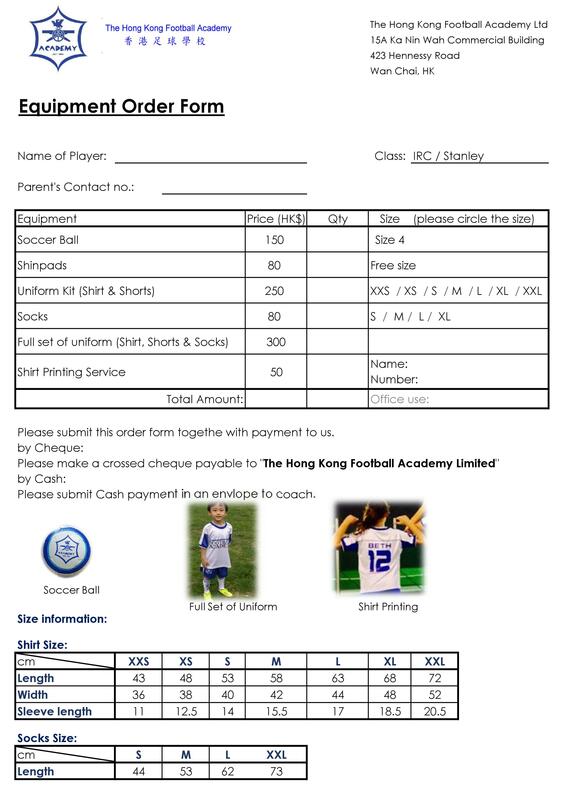 Crossed cheque payable to THE HONG KONG FOOTBALL ACADEMY LIMITED. Please write down the player’s name, phone number of the parent at the back of the cheque. 1. Order will be placed once the filled in form and payment are received. 2. An order may be ready in at least a week’s time, depending on availability of stock. 3. Printing services may take about 2 to 4 weeks. 4. Once an order is ready, it will be picked up at the pitch.